Israel stabbings: At least 17 reported since last Wednesday in deterioration of Palestine relations. Police search for a man suspected of stabbing people on a bus on Monday in Jerusalem. At least 17 random stabbing attacks against Israelis have been reported since last Wednesday in an escalation of the sporadic violence that began weeks ago with a confrontation between Israeli security forces and Palestinian protesters at the site of the al-Aqsa Mosque in Jerusalem. A man was stabbed in Jerusalem’s Old City near the Temple Mount. A man who had taken a rifle from an Israeli soldier attempted to stab a woman in the town of Kiryat Gat after breaking into her apartment. A man was stabbed outside a shopping center in the town of Petah Tikva. 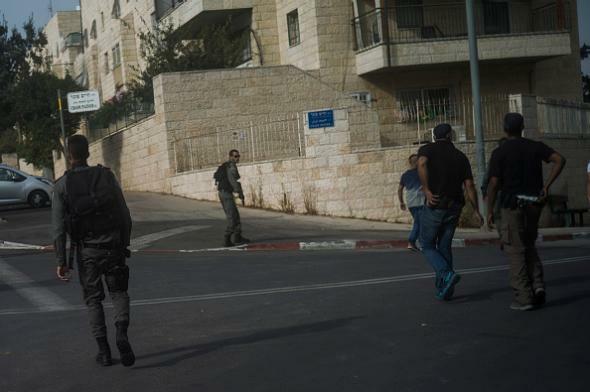 Police officers in East Jerusalem took a man into custody after he tried to stab them. A man was stabbed near a light rail station in Jerusalem. Five people were injured in Tel Aviv by a man with a screwdriver. A man was stabbed near Hebron in the West Bank. A soldier was stabbed in the town of Afula. A 14-year-old was stabbed with a vegetable peeler in Jerusalem. A police officer shot and killed a man who tried to stab him near the West Bank settlement of Kiryat Arba. A woman was shot by authorities after attempting to stab several people at a bus station in Afula. Two people were stabbed by a 16-year-old near the gates of the Old City. Two policemen were stabbed near the site of the first Old City attack. Four people were stabbed in a single attack near the city of Hadera. A policeman was stabbed in the Old City. A policeman was stabbed near police headquarters in Jerusalem. A 13-year-old and a 20-year-old were stabbed by a pair of teenage attackers in the settlement of Pisgat Zeev.